History of Indo-Caribbean Icons - J A Y A D E V I Arts Inc. - "Preserving IndoCaribbean Arts & Culture"
PIYA PYAREE For the first one hundred years in the colony, East Indian women did not dance on the public stage as performers, though they were singers and musicians, and danced privately at matikors and mouran (shaving of newborn's hair) ceremonies. 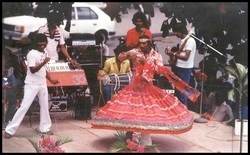 Men, including the lauda ki naach dancers who dressed and performed as women, danced publicly. (It was these dancers that attracted Pita Pyaree when she was a child, eventually prompting her to dance later.) Initially, two dance styles based on imported folk traditions were prominent within the Indian community; the nagara (solo act, energetic, very acrobatic moves) and jatkay ki naach (swirls, subtle hip moves, emphasis on graceful tendencies, elaborate hand gestures). But, at the turn of the twentieth century as the indenture scheme waned, a third style rajdhar, appeared. It developed rigid ties with local tan sangeet and absorbed moves and mannerisms from the other two schools of dance, with an emphasis on intricate pouti (footwork); those who danced in this tradition were called rajdharies. It is this rajdhar style that Pita Pyaree adopted (especially the pouti), after she received dance instructions while on a Trinidad 1939. CHAMPA DEVI was one of the pioneer Indo-Caribbean Dancer who sang while dancing. Both singing and dancing were in union. When Champa retired from singing and dancing after performing five months into her pregnancy in the 1950s, the era of the great Indo-Caribbean Natch Queens came to an end. Like her earlier pregnancies, the baby was a healthy little doll! She was celebrated in Trinidad, her native land, Guyana and Suriname for her exceptional beauty, her versatile singing voice and extensive song repertory, her dazzling dancing with bells laden on her feet, her dramatic interpretations, her mastery or Urdu, her intelligent reading of her audience, and her understanding that people want to feel happy and uplifted by art. After her retirement, the Indo-Caribbean nautch tradition got separated-- singing and dancing. Together wit Pita Pyari of Guyana Champa also contributed to the universal tradition of Indo-Caribbean art. They are both of Muslim religion and cherished their connections with the pervasive HIndu-Muslim syncretistic culture, yet never feeling that they had to abandon one for the other. They also ventured into all that was happening in their time-- filmi, western entertainment, creole- and never thought that contemporary creativity and innovation presented a threat to their consciousness and adherence to tradition. Champa's many philanthropic works has been invaluable , but unknown, lik performing free for fundraising for the Bengal Relief Fund in the 1940s. At the 100th Centennial Indian Arrival Day in Trinidad, the commerorative publication records for posterity '250,000 people crowded the tents for Champa Devi'. Johnny went on to learn the trade of a professional Barber and he moved to the UK in 1964 where he opened his first Barber and Record shop in Leeds. He was married to Pearlina Mykoo (nee-Baccas) and they had seven children - Yvonne, Philip, Trevor, Christine, Richard, Jason and Steve. While living there he had a dream from a Sadhu (an old Hindu sage) to return to Jamaica to make Indian music. He returned to Jamaica in 1969 where his dream eventually became reality when he founded the Raja Sarangie Group in 1974. Sadly, in 1981 his wife passed away though he went on to remarry and had another son, Surruj. Master Artist and Eminent Scholar of Indo-Caribbean music and culture Rudy ~always remembered! 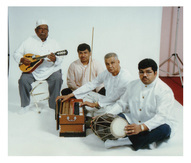 CHOWTAL RANG BAHAR: Compiled by Rudy Sasenarine, Edited by Dr Peter ManuelPREM SANGEET ORCHESTRA (L-R) Guru Bharat Das, Ustads Dhanram, Kaloush Budhu, Rudy RamnarineRamnarine Sasenarine, Instructor” Chowtal Gol - is a master drummer and eminent community scholar of Indo-Caribbean music and culture. He was born in Miss Phoebe village in the Port Mourant district of Berbice, Guyana in South America. At age 7, Rudy began playing dholak for his grandmothers and mother who were active in a ladies singing group. His formal training in all styles of music and drumming began with Ustad Deowa, son of the legendary drummer, Ustad Mohana. He continued studying tan sangeet tala, raga and ragini with Ustad Balgobin Singh, renowned singer, and Guru Ramdhani, the dholak virtuoso. Rudy went on to learn the Trinidad style of tan music with Ustad Krishna Persaud. He is unique in his mastery of both Bhojpuri (North Indian) and Madrasi (South Indian) drum traditions. 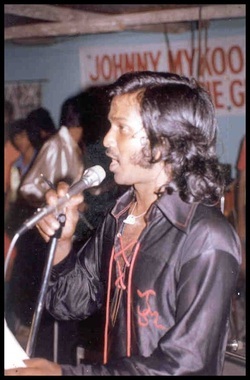 Ramnarine Sasenarine’s vast repertory includes Biraha, Tassa, Tadjah, Chowtal, Thappu, Tan, Ramayan, Women and Men Folk Songs for life-cycle ceremonies, and popular film and chutney music. In 1979, Rudy moved to New York where he continued his studies of Chowtal and Ramayan with the master custodian and composer, Tej Singh. In the early 1980s, he became a founder member of the performing gols, (circles) Prem Sangeet in Tan Singing, and captained his own Chowtal Gol at the Mahatma Gandhi Satsangh in Queens, New York. As Music Director at RCC, Rudy developed the syllabus and cirricuulum for GOLS community singing circles, an inter-generational program led by master artists and tradition-bearers of Indian seasonal and life-cycle song and music traditions, passed down orally through generations for hundreds of years. Preserved in Guyana, Suriname and Trinidad and brought to the U.S. during the 1960-70s. Rudy believed that it was critical to pass our dying heritage arts onto new generations and the community at large. Through exploration of lyrics, participants would learn about the dynamic history of Indo-Caribbean people - their laughter and pain, courage and playfulness, joys and discoveries. These inter-generational workshops would give men and women, boys and girls a chance to learn and practice Chowtal (Phagwa, Spring, Planting), Ramayana (Diwali, Fall, Harvest), and, Maticoor/Matikor, Kanyadaan, Vivaha (Wedding); Sohar, Mouran (Lullabyes, Birthing). And most importantly, these workshops would provide a space for family sharing and reconnecting to community. A skilled craftsman, Rudy makes the dholak drum. Rudy performed at many institutions throughout the United States. He performed regularly at Indo-Caribbean, Gujrati, and Punjabi community events. Rudy was Music Director, Consultant, Performer and Teaching Artist for the Rajkumari Center since 1997. In 2011, he became Member of our Board of Directors as Chair of our Heritage and Preservation Program. RUDY, Gone But Always Revered!